Summer time for me growing up is flying kites (we had the cheap plastic ones), going to the beach, collecting rocks, and a lot of swimming. We also collected recyclables to redeem for cash, read books (mostly me, my siblings aren't as much into reading as I), and fished. The Boston area has been more spring-like than summery this week as we have had rain pretty much each day since Sunday. 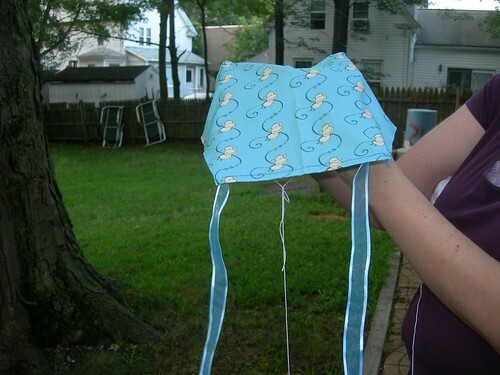 So, I did what any respectable New Englander would do and I made a kite. I used this tutorial, but used fabrics and ribbons instead of plastic bags. Click on any of the pictures to see the full size on Flickr. 1. Print the template to fit an 8.5 by 11 inch sheet of paper. Fold over the bottom, and hand sew a hem on the bottom with tiny pockets in the bottommost corners for the bamboo skewers to fit. Fold over and sew a single width of fabric, no greater than 1/8th inch, on each of the remaining sides to clean up the edges. 2. At the two topmost points, sew on two triangular pieces of scrap fabric to help hold the skewers into place. 3. Next place the skewers over the fabric and marked where to cut them to fit the kite. Cut the skewers at the marked area with a pair of scissors. Insert skewers into the fabric pockets. Sew the skewer to the fabric by sewing around the skewer near the middle of the fabric. 4. Cut 2 strips of ribbon about 1.5 to 2 inches long. Fold in half and sew to the outer most points of the fabric base. 5. Cut the remaining ribbon in half and sew around the bottom of each skewer. 6. Attach crochet cotton or other light (the lighter the better) thread as per the tutorial. I would err on the side of too much thread for the bridle. Mine had a harder time in flight partially because my heavier material, but also because the thread was a little too tight to allow the easiest lift. I used a gauzy ribbon, but was hoping for some happy monkeys or beach themed ribbon. This was a fun little project, which I think I will refine over the upcoming week. While it flew sort of, I'm sure I can make sure it goes a lot better!